So what went wrong.? This is easy. Against Italy, England attacked and looked fresh and even though they eventually lost, they made a good account of themselves. The England that turned up last Thursday, reverted to type, and were poor going forward with little transition from midfield, relying on long balls from Gerrard. Once or twice, Sterling showed his skills in the first half, but not enough for me. You could argue, that the Uruguay captain should of been dismissed for a chop at Sturridge’s neck, post a previous yellow, but he wasn’t, blah, blah. Rooney showed enough of his class when he was reinstated to the middle of the attack, and was linking up well, when he got the ball (normally by running 30 yrds back for it). People are saying he should of scored with the header from about a foot out that hit the bar. Take another look. The angle of attack and the jump he made, shows actually how well he did to keep it from not going over. Tactically, England were naive as well. Once they got back level, they should of taken the draw, and pushed CRC in their final game, but no they pushed on too much, and Gerrard flicked a beauty on to assist his Liverpool team mate get his second, and the winner. This attempt to win brought another error along with it. The introduction of Ross Barkley. Now I went over this last time, but he is just not good enough for top flight international football yet. He gave the ball away nearly every time he had it. Shocking. Why not bring on Frank Lampard (for Jordan Henderson). Someone with the experience and more importantly the skill to close out a game and get the point. What was the point of taking the fella for what must be his last tournament, make him vice captain, and then don’t play him. If I was Frank, and Roy gives me the armband for the next dead rubber game because Stevie’s knackered, I’d tell him where to go. Going back to the Sterling substitution, as well as Barkley being poor, Sterling looked like one of the only players capable of going past anyone at this point, so why take him off. Also, Gerrard might not have been that deep if he trusted his left back. Baines was terrible , Shaw nowhere to be seen, and Ashley Cole sitting at home. To improve and learn from this is now the key. One thing we definitely need to do is learn to go past people. We try and pass through teams and the poor teams are now too organised to allow this to happen. See Iran against Argentina, and Ghana. Not superstars, but organised to not concede. So on to the Euros with Roy at the helm, and Ross Barkley commanding the midfield after the retirements of Gerrard and Lampard (currently a guess, to be confirmed tomorrow). Cannot wait. 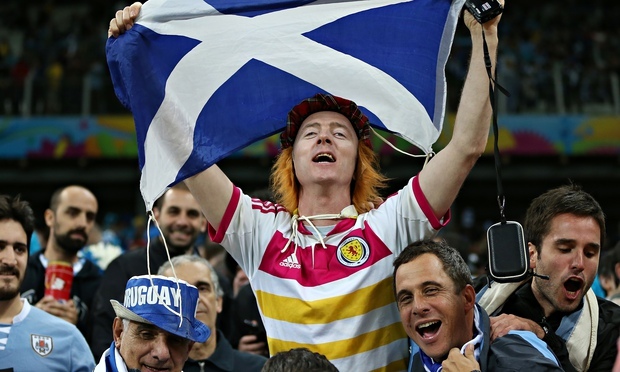 Best bit of the game was spotting my first Scotland fan at the WC, in the Uruguay end. They attend every World Cup, whether they are in it or not, and in my (biased) estimation the best international supporters in the world. Fair play Mark McConville . AGAINST WHO ! Another signing for the Hammers Diame on his way ?